LONDON, England -- (CNN) -- The construction of the first golf course designed by Tiger Woods, currently being built on the outskirts of Dubai, has been hit by delays. 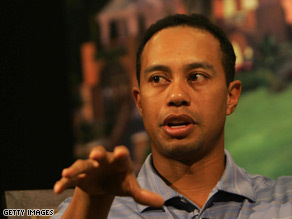 Tiger Woods speaking at the unveiling of the planned development in Dubai in August, 2008. The "Tiger Woods Dubai" was seen as the Emirate's crowning glory in its bid to become a hub for golf development, after attracting other marquee-name designers including Ernie Els, Sergio Garcia and Greg Norman to the area. But CNN has exclusively learnt that the official opening of Woods' 18 holes on the Al Ruwaya course, due to be ready by September, will now not take place until at least April. It is understood that just six holes will be opened in September, three of which were fully grassed in May before the heat of summer, where temperatures often reach 45 degrees Celsius. The $1 billion project being built by construction company Tatweer includes 197 "palaces, mansions and villas" over an area of 55 million square feet and was launched in 2006 to much fanfare. Phase one of the project, which includes the golf course, an academy and driving range was due to be completed in the last quarter of this year. The second phase, which includes 360,000 square feet boutique hotel and the gated village is scheduled to be completed by the second or third quarter of 2010. A spokesperson for the course denied there were any delays. "In terms of the timeline to club opening, we will announce our specific timeline and opening closer to the opening date in conjunction with IMG and Tiger Woods," said the spokesperson. It is another blow for the Emirate where other projects have been subject to difficulties in recent times. Developers such as Leisurecorp, the company behind the $20 million "Race to Dubai" event have been blighted by falling land prices. Real estate consultancy Colliers International recently reported property prices in Dubai had plunged 41 percent during the first three months of 2009. Colliers said prices had fallen as global finance has dried up and job opportunities in Dubai have declined.